Goodwill’s Culinary Institute is a comprehensive, hands-on program providing students with practical, real-world training in the food service industry. Students are able to practice these skills daily in Café 1919, Goodwill’s own food service operation located in our James O. Wright Center on Milwaukee’s northwest side. Students prepare and serve up to 300 meals per day. In addition to food preparation and serving skills, students also receive training in sanitation, kitchen communication, knife skills, weights and measures, and use of equipment. 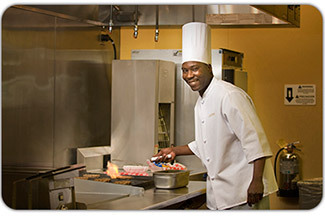 The program prepares students for employment in a number of settings including hospitals, hotels, schools and restaurants.